Chhatrapati Shivaji Maharaj is considered to be the most iconic model in the state of Maharashtra, India. His tales and feats have been long told as the lessons and legends throughout India. 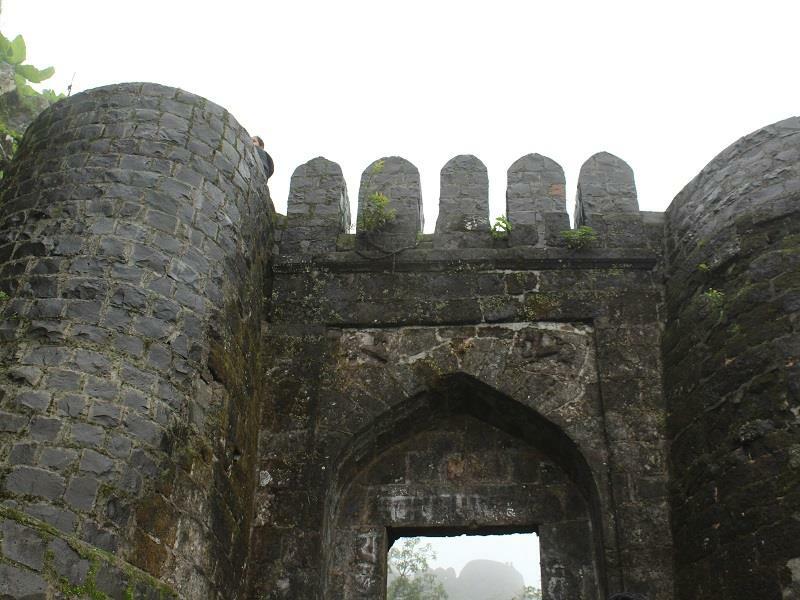 The legend describes the trustworthiness, bravery and honour held strong bond among the walls of Sinhagad fort, formerly known as Kondana fort. Tanaji Malusare, abandoned his son's wedding to meet with the summons of Maharaj Shivaji to conquer the fort. Tanaji planned his reinforcement to surprise the enemy with an unexpected entry for which he chose to enter the Kalyan village(now marked by Kalyan Darwaza," passage/door"). This side of the fort had a steep incline, an impossible task by foot along a cavalry so they used trained monitor lizards (Gorpad, in local language Marathi) to scale the altitude. This was a successful attempt of invasion but the battle ended with Tanaji losing his life, in spite of losing his shield and yet continuing the fight till the very last breath. This is known as one of the most told sacrifices made for Shivaji and signifies the very first line of this article. This battle of the late seventeenth century was marked after the fort was conquered later and Tanaji's tomb built in this fort. The fort was chosen to build the tomb of Maharaj Rajaram, the youngest son of Shivaji. The most preferred time of the year to visit the fort is in the monsoons i.e. June to September. The mountain is covered with a blanket of clouds usually this of the year and frequent slight rains are common, thus it is preferable to wear rain covers or enjoy the drizzles with the gusty wind blowing throughout. 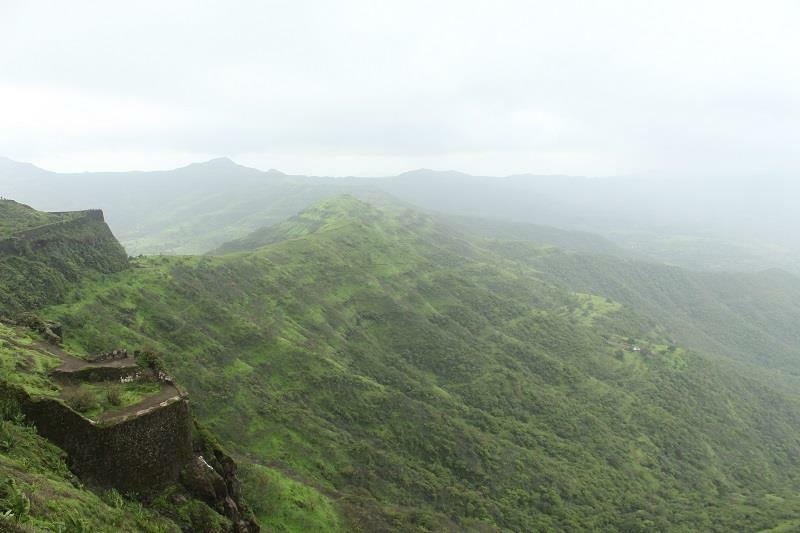 Sinhagad fort is covered with green moss and ferns along with lush greenery throughout the fort grounds. Usually, at this period of the year tourists may not see the sun setting and the fabulous orange to red gradient sky. This can be witnessed during the winters i.e. November. A memorial statue of the bust of Tanaji and his tomb situated right next to it. Here one can find a personnel dressed in the attire and telling the story of the great Tanaji Malusare. Built later on to signify the tale of Tanaji's route to invade the fort. This is facing the Kalyan village and hence the name. a reservoir of sweet water that stores water naturally coming down the mountain. Though it was meant to be drinkable on my visit I could find trash littered by tourists (a poor thing to do in contrary to preserving its significance). One of the prime watch towers of the fort which were once manned with cannons to protect invasions. These watchtowers were an important reason for Tanaji to have chosen the unpredictable path of invasion. This is the spot located in the North West of the sinhagad fort and must visit spot if one visits this fort. The force of the wind blowing at this point is strong enough to make someone stumble or at least challenging to challenging to walk. Here, water falls off the cliff up to a depth of 30–40 feet and the wind carries the water back to the top, hence the name reverse falls. Also, a picturesque view of the valleys and mountain trails covered gently with cotton-like clouds would make one want to stay and embrace the landscape to the deepest core. The local food of the region is Pittala – Bhakari and Kanda Bhaji. The first one is a combination of gramme flour batter (Bhakari) and bread made out of bajra (Pittala). During the war, the shortage of food was dealt with the distribution of one-quarter at a time of pittala alongside bhakari so that no food goes to waste. Lokmanya Tilak resided in this fort during the freedom struggle of India against the British is a places to visit near sinhagad fort. There is a memorial with a cannon on both sides that marks the fact. Throughout the fort ruins, such peculiar spots would show the pride held strong by the fort in a way that is uncommon. This fort presents a view of Torna fort, another one of Shivaji's accomplishment (in fact this fort was conquered by him at the age of 16). Also a view of a huge reservoir held by one of the largest artificial structure, Khadakvasla Dam. Shore line near the Khadakvasla dam is an evening hangout spot for most of the locals and tourists. The Sinhagad Fort could present some great subjects for Macro photography enthusiasts as well. The Malabar Whistling Thrush is a common sighting at the top. Its call is a peculiar one and the blue shine over a black body makes the viewer pleased of its appearance. There are vendors selling raw mangoes, cucumber, corn, peanuts and berries which could serve as munchies crave in during the trek.